Elite athletes—which for the purpose of this article will be defined as athletes capable of competing at a varsity or university level or higher—have long sought competitive advantages in sport. In recent years, sleep has increasingly been recognized as a controllable factor that can modify performance for elite athletes. Coinciding with advances in sport and sleep science, along with nutrition, mental health, and wellness, sleep is being recognized as an important part of an advanced training regimen rather than a static state of inactivity. 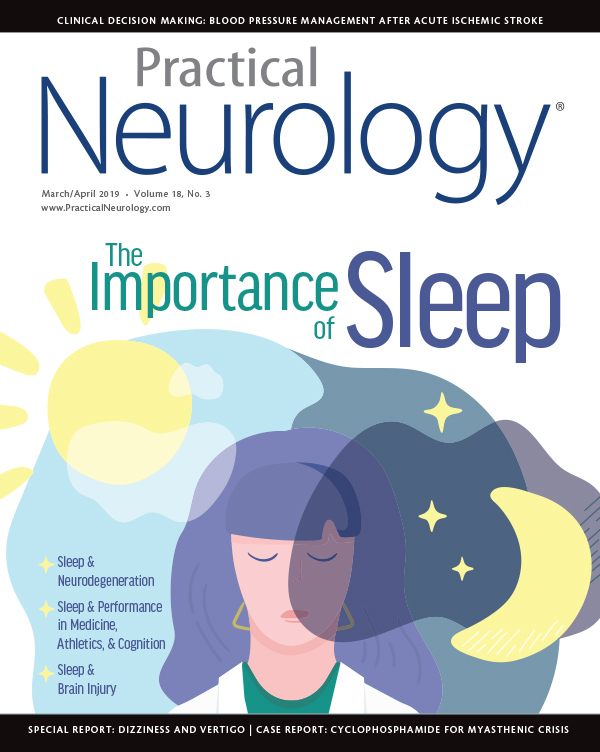 This review provides an overview of current scientific research on sleep as a performance factor and how this knowledge can be applied in practice. A range of factors that can influence sleep in athletes (Figure 1). Some factors are specific to an individual athlete, but many others are directly attributable to the athletic environment, which can significantly limit sleep particularly at an elite level. Although there are too many factors to name all, the major factors to account for when considering athletes’ sleep needs include season and off-season length, practice time and duration, competitive time, and travel. Complicating this further, many elite athletes are still amateur athletes, for whom sport must contend for time with school or work. At the individual level, variables that influence sleep include medical, psychologic, or sleep disorders, and underlying levels of pain. Individuals also have differing sleep needs, responses to sleep loss, and preferred sleep times (eg, the “morning lark” or a “night owl”). Figure 1. Factors that can influence, and in many cases impair, sleep in elite athletes include factors unique to the individual, their sleep hygiene, and health (blue ovals) and extrinsic environmental factors (large yellow arrows), many of which are engrained in sport. Total sleep time for elite athletes can often dip below the minimum 7 hours recommended for optimal health,3 especially during periods of high physical load. In a study, elite swimmers averaged 5.4 hours of sleep on nights before training, and 7.1 hours—a better but still seemingly inadequate amount—on rest days.4 Athletes in many sports must contend with persistently early morning competition times that restrict time spent in bed. For sports with more variable schedules, timing of practice and competition can still influence sleep. Elite football players slept on average 157 minutes less after nighttime matches than after daytime matches and 181 minutes less than after a training day.5 To supplement nighttime sleep, athletes may turn to napping. Although naps of up to 2 hours during the day may be effective in recovering lost sleep,6 naps that are too long, or too late in the day, may interfere with nighttime sleep, and thus, are not a long-term solution. Sleep can also directly affect athletic performance. Num-erous studies show variations in the physical and cognitive demands of athletics that vary with sleep-wake state. Aerobic, anaerobic, and cognitive performance change throughout the day in accordance with the circadian rhythms of the body. Generally mirroring core body temperature, these functions are typically maximal in the late afternoon and early evening (Figure 2). Superimposed on these fluctuations, performance will degrade with sleep loss.12 A recent example demonstrated slower cycling times following just 1 night of sleep restriction (mean sleep of 2.4 hours) vs a full night of rest (mean sleep of 7.1 hours).13 In another study examining how jet lag disrupts circadian variations of performance, teams in Major League Baseball were found to perform worse when crossing 2 or more time zones.14 These studies, along with those discussed previously, demonstrate how real-world conditions—excessive practice, travel, and unusual competition times—can quickly and profoundly degrade performance by reducing sleep and performance at times other than the physiologic peak. Figure 2. 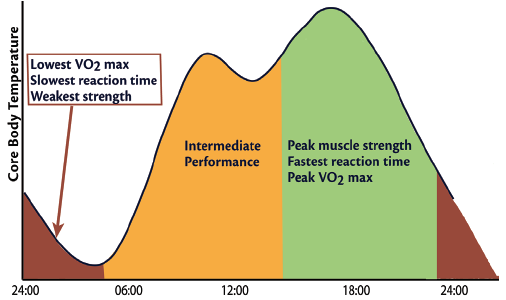 Variations in physical performance during a 24-hour period closely mirror fluctuations in core body temperature, including changes in aerobic output (VO2max), anaerobic output (muscle strength), and reaction time. Collegiate basketball players allowed to sleep up to 10 hours per day (mean = 8.5 hours/night) over 7 weeks had increased sprint speed and shooting accuracy.15 Collegiate tennis players increased serving accuracy after sleep time was increased by 2 hours.16 After extending sleep from 6.3 to 6.9 hours per night for 5 nights, professional baseball players showed improved visual attention and cognition,17 both of which are key features for pitch recognition when in the batter’s box. It is unclear whether performance improvements are from recovery of a baseline sleep deficit, or because “banking” extra sleep provides added value. Also unsettled is the correct amount of sleep necessary for full recovery and optimal performance. What the studies referenced do suggest is that many elite athletes’ performance benefits from sleeping more. Even if allowed the opportunity for adequate rest, some athletes have sleep disorders that compromise sleep quality. Elite athletes also face unique circumstances that may predispose them to sleep disorders. Performance anxiety is common; more than 60% of athletes reported insomnia the night before competition.18 Even without this, the elite-athlete lifestyle can include frequent travel, variable schedules, and injury or pain, that can predispose individuals to insomnia. Football players, weight lifters, and others who rely on body mass as an advantage, may have risk for obstructive sleep apnea, which has been found in 8% of collegiate football players tested, although up to 50% of them were considered high risk based on body habitus.19 Still more sleep disorders, such as circadian rhythm disorders and restless legs syndrome, will undoubtedly be found in athlete populations due to their high prevalence in the general population, although exact rates have not been evaluated. To help understand the role of sleep in athletes, the Athlete Sleep Behavior Questionnaire was designed to identify maladaptive sleep practices in elite athletes20 and provides good insight into abnormal sleep behaviors that may require intervention. The Athlete Sleep Screening Questionnaire was designed to identify athletes at high risk for sleep disorders, to direct them toward appropriate specialists and testing.21 Because athletes generally report worse scores on commonly available sleep surveys,1,2 specialized assessments addressing their unique circumstances and needs may be more specific. 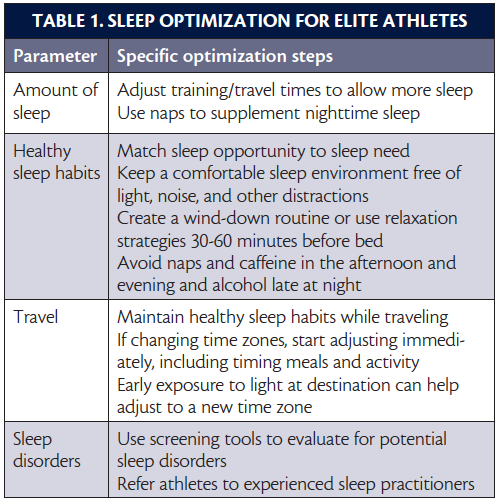 Clearly, optimization of sleep in elite athletes can be complicated. With numerous competing demands for time, it can be easy for sleep to be deprioritized. This is why, although the science is advanced, the message to athletes should be simple: thinking about how you sleep can help you perform better when you are awake. A framework for this (Table 1) may include adjustment of training schedules to allow for maximum sleep for proper recovery, planning travel and activity so that the sleep opportunity and competition times match circadian cycles, and review of sleep hygiene and other techniques to help with wind-down and relaxation before bedtime.22 Individual athletes may present with unique challenges, or persistent difficulties with sleep or wakefulness, at which time referral to a sleep practitioner with experience in elite athlete populations may be indicated.21 Often, little can be done regarding frequency and timing of competitions that, in many cases, have become either institutionalized or driven by financial incentives. 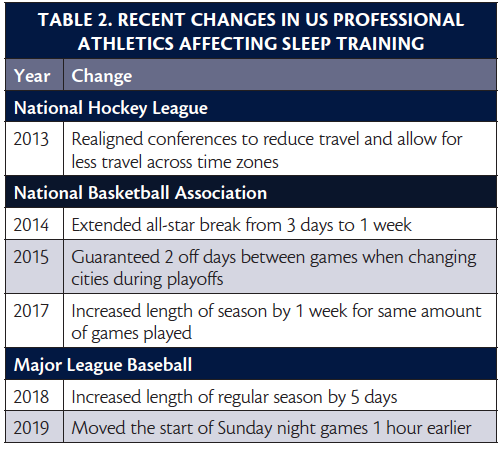 It should be noted, however, that several organizations in the US have recently adopted changes (Table 2) to allow for more recovery time between contests and easier travel schedules. Although these changes are by no means comprehensive, they do suggest that sleep and recovery needs are becoming better recognized. As sleep science continues to grow among elite athletes, to best serve our patients we should understand that several limitations remain. Symptoms of disturbed sleep are common, and athlete sleep remains highly variable, dependent on many factors often outside their control, including competition and training schedules. Sleep education and access to sleep services or practitioners, even at the highest levels of competition, can be fragmented or incomplete. Elite athletes may still receive information and instruction second or thirdhand or rely on unproven or untested measures or substances. In some circles, a “warrior” mentality persists in which sleep is viewed as a weakness or limitation to success. Sleep in elite athletes is often difficult to study, and the available literature is dominated by studies with very small sample sizes or larger population studies without proper controls. Often, sleep research in normal healthy controls (itself often limited by sample size) is applied to elite athlete populations, but it remains unclear if sleep demands in elite athletes are the same or different as in the general population, or even if sleep principles for athletes in sports that hinge on very different skill sets can be applied to each other (eg, long-distance runners vs weight lifters). Despite these limitations, the future for sleep as a foundational aspect of performance in elite athletes appears strong. There is a demonstrable relationship between sleep/circadian principles and performance. There is still much to be learned about the nature of this relationship, underscoring the potential for much basic science and clinical research. Even beyond research into direct performance effects, there is great need for understanding of the role of sleep in nutrition, injury, pain, mental health, and wellness. With this, there will continue to be an increase in the promotion of sleep among athletes at all levels of competition. With a small margin between success and failure, elite athletes need to consider how they sleep, when they sleep, and how much they sleep for peak performance. Athletes’ sleep can be disturbed for myriad reasons, many of which are ingrained in the environment of athletics. However, as research in the field advances, barriers to optimal sleep are decreasing, and sleep is increasingly recognized as a performance and recovery tool among athletes, as well as coaches and the health care providers who support their performance. 1. Mah CD, Kezirian EJ, Marcello BM, Dement WC. Poor sleep quality and insufficient sleep of a collegiate student-athlete population. Sleep Health. 2018;4(3):251-257. 2. Knufinke M, Nieuwenhus A, Geurts SAE, Coenen AML, Kompier MAJ. Self-reported sleep quantity, quality and sleep hygiene in elite athletes. J Sleep Res. 2018;27(1):78-85. 3. Consensus Conference Panel. Recommended amount of sleep for a healthy adult: a joint consensus statement of the American Academy of Sleep Medicine and Sleep Research Society. J Clin Sleep Med. 2015;11(6):591-592. 4. Sargent C, Lastella M, Halson SL, Roach GD. The impact of training schedules on the sleep and fatigue of elite athletes. Chronobiol Int. 2014;31(10):1160-1168. 5. Fullagar HH, Skorski S, Duffield R, et al. Impaired sleep and recovery after night matches in elite football players. J Sports Sci. 2016;34(14):1333-1339. 6. Romyn G, Lastella M, Miller DJ, et al. Daytime naps can be used to supplement night-time sleep in athletes. Chronobiol Int. 2018;35(6):865-868. 7. Venter RE. Perceptions of team athletes on the importance of recovery modalities. Eur J Sports Sci. 2014;14(S1):S69-S76. 8. Sawczuk T, Jones B, Scantlebury S, Till K. The influence of training load, exposure to match play and sleep duration on daily wellbeing measures in youth athletes. J Sports Sci. 2018;36(21):2431-2437. 9. Milewski MD, Skaggs DL, Bishop GA, et al. Chronic lack of sleep is associated with increased sports injuries in adolescent athletes. J Pediatr Orthop. 2014;34(2):129-133. 11. Lastella M, Vincent GE, Duffield R, et al. Can sleep be used as an indicator of overreaching and overtraining in athletes? Front Physiol. 2018;9:436. 12. Kutscher SJ. Sleep and athletic performance. In: Kryger M, ed. Principles and Practice of Sleep Medicine. 6th ed. Elsevier, Inc; 2017:646-652. 13. Chase JD, Roberson PA, Saunders MJ, et al. One night of sleep restriction following exercise 3-km cycling time-trial performance in the morning. Appl Physiol Nutr Metab. 2017;42(9):909-915. 14. Song A, Severini T, Allada R. How jet lag impairs Major League Baseball performance. Proc Natl Acad Sci USA. 2017;114(6):1407-1412. 15. Mah CD, Mah KE, Kezirian EJ, Dement WC. The effects of sleep extension on the athletic performance of collegiate basketball players. Sleep. 2011;34(7):943-950. 16. Schwartz J, Simon RD. Sleep extension improves serving accuracy: A study with college varsity tennis players. Physiol Behav. 2015;151:541-544. 17. Mah CD, Anguera JA, Gazzaley A, Luke A. Sleep loading improves visual search response time and reduces fatigue in professional baseball players. Sleep. 2017;40:A278. 18. Juliff LE, Halson SL, Peiffer JJ. Understanding sleep disturbance in athletes prior to important competitions. J Sci Med Sport. 2015;18(1):13-18. 19. Dobrosielski DA, Nichols D, Ford J, et al. Estimating the prevalence of sleep-disordered breathing among collegiate football players. Respir Care. 2016;61(9):1144-1150. 20. Driller MW, Mah CD, Halson SL. Development of the athlete sleep behavior questionnaire: a tool for identifying maladaptive sleep practices in elite athletes. Sleep Sci. 2018;11(1):37-44. 21. Samuels C, James L, Lawson D, MeeuWisse W. The athlete sleep screening questionnaire: a new tool for assessing and managing sleep in elite athletes. Br J Sports Med. 2016;50(7):418-422. 22. Simpson NS, Gibbs EL, Matheson GO. Optimizing sleep to maximize performance: implications and recommendations for elite athletes. Scand J Med Sci Sports. 2017;27(3):266-274. The author has no financial or other relationships related to this content to disclose.